In this Basque name, the first family name is Unamuno and the second is Jugo. Miguel de Unamuno was born in Bilbao, a port city of Basque Country, Spain, the son of Félix de Unamuno and Salomé Jugo. As a young man, he was interested in the Basque language and competed for a teaching position in the Instituto de Bilbao against Sabino Arana. The contest was finally won by the Basque scholar Resurrección María de Azkue. Unamuno worked in all major genres: the essay, the novel, poetry, and theater, and, as a modernist, contributed greatly to dissolving the boundaries between genres. 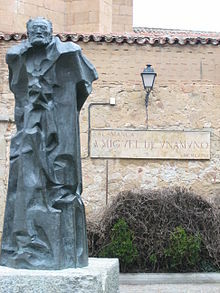 There is some debate as to whether Unamuno was in fact a member of the Generation of '98, an ex post facto literary group of Spanish intellectuals and philosophers that was the creation of José Martínez Ruiz (Azorín) — a group that includes, besides Azorín, Antonio Machado, Ramón Pérez de Ayala, Pío Baroja, Ramón del Valle-Inclán, Ramiro de Maeztu, and Ángel Ganivet, among others. Unamuno would have preferred to be a philosophy professor, but was unable to get an academic appointment; philosophy was in Spain somewhat politicized. Instead he became a Greek professor. In 1901 Unamuno gave his well-known conference on the scientific and literary inviability of the Basque. According to Azurmendi, Unamuno went against the Basque language once his political views changed along his reflection on Spain. In addition to his writing, Unamuno played an important role in the intellectual life of Spain. He served as rector of the University of Salamanca for two periods: from 1900 to 1924 and 1930 to 1936, during a time of great social and political upheaval. During the 1910s and 1920s, he became one of the most passionate advocates of Spanish liberalism. Unamuno linked his liberalism with his hometown of Bilbao, which, through its commerce and connection with the civilized world, Unamuno believed had developed an individualism and independent outlook in stark contrast to the narrow-mindedness of Carlist traditionalism. When in 1912 José Canalejas was assassinated by an anarchist, he blamed it on the fact that Spain lacked a "true liberal democratic party" and in 1914 denounced the large property owners for their negligence and ignorance. Along with many other Spanish writers and intellectuals, such as Benito Pérez Galdós, he was an outspoken supporter of the Allied cause during the First World War despite Spain's official neutrality. Unamuno viewed the war as a crusade not just against the bellicose authoritarianism of the Germans, but against their sympathizers in Spain, and intensified his attacks on Alfonso XIII and the Spanish monarchy. Unamuno was removed from his two university chairs by the dictator General Miguel Primo de Rivera in 1924, over the protests of other Spanish intellectuals. As a result of his vociferous criticisms of Primo de Rivera's dictatorship, he lived in exile until 1930, first banished to Fuerteventura, one of the Canary Islands; his house there is now a museum, as is his house in Salamanca. From Fuerteventura he escaped to France, as related in his book De Fuerteventura a Paris. After a year in Paris, Unamuno established himself in Hendaye, a border town in the French Basque Country, as close to Spain as he could get while remaining in France. Unamuno returned to Spain after the fall of General Primo de Rivera's dictatorship in 1930 and took up his rectorship again. It is said in Salamanca that the day he returned to the University, Unamuno began his lecture by saying "As we were saying yesterday..." (Decíamos ayer...) as Fray Luis de León had done in the same place in 1576, after four years of imprisonment by the Inquisition. It was as though he had not been absent at all. After the fall of Primo de Rivera's dictatorship, Spain embarked on its Second Republic. He was a candidate on the Republican/Socialist ticket and was elected, after which he led a large demonstration in the Plaza Mayor in which he raised the Republic's flag and declared its victory. He always was a moderate and refused all political and anticlerical extremisms. No, I have not become a right-winger. Pay no mind to what people say. No, I have not betrayed the cause of liberty. But for now, it's totally essential that order be restored. But one day I will rise up -- soon -- and throw myself into the fight for liberty, by myself. No, I am neither fascist nor Bolshevik. I am alone!...Like Croce in Italy, I am alone! Broken-hearted, he was placed under house arrest by Franco, and his death followed ten weeks later, on 31 December. Unamuno died while sleeping, which he regarded as the best and most painless way to die. Unamuno was a well-known lusophile, being probably the best Spanish connoisseur of Portuguese culture, literature, and history of his time. He believed it was as important for a Spaniard to become familiar with the great names of Portuguese literature as with those of Catalan literature. He was also a supporter of Iberian Federalism. In the final analysis Unamuno's significance is that he was one of a number of notable interwar intellectuals, along with luminaries such as Julien Benda, Karl Jaspers, Johan Huizinga, and José Ortega y Gasset, who resisted the intrusion of ideology into Western intellectual life. Paz en la guerra (Peace in War) (1897) — a novel that explores the relationship of self and world through familiarity with death. It is based on his experiences as a child during the Carlist siege of Bilbao in the Third Carlist War. Amor y pedagogía (Love and Pedagogy) (1902) — a novel uniting comedy and tragedy in an absurd parody of positivist sociology. El espejo de la muerte (The Mirror of Death) (1913) — a collection of stories. Niebla (Mist) (1914) — one of Unamuno's key works, which he called a nivola to distinguish it from the supposedly fixed form of the novel ("novela" in Spanish). Vida de Don Quijote y Sancho (usually translated into English as Our Lord Don Quixote) (1914) — another key work of Unamuno, often perceived one of the earliest works applying existential elements to Don Quixote. The book, on Unamuno's own admission, is of mixed genre with elements of personal essay, philosophy, and fiction. Unamuno felt that Cervantes had not told the story of Don Quijote very well, cluttering it with unrelated tales. This work was Don Quixote the way Unamuno thought it should have been written. He felt that as a quijotista (a fan or student of Don Quixote) he was superior to Cervantes. The work is primarily of interest to those studying Unamuno, not Cervantes. Abel Sánchez (1917) — a novel that uses the story of Cain and Abel to explore envy. Tulio Montalbán (1920) — a short novel on the threat of a man's public image undoing his true personality, a problem familiar to the famous Unamuno. Tres novelas ejemplares y un prólogo (Three Exemplary Novels and a Prologue) (1920) — a much-studied work with a famous prologue. The title deliberately recalls the famous Novelas ejemplares of Miguel de Cervantes. La tía Tula (Aunt Tula) (1921) — his final large-scale novel, a work about maternity, a theme that he had already examined in Amor y pedagogía and Dos madres. Teresa (1924) — a narrative work that contains romantic poetry, achieving an ideal through the re-creation of the beloved. Cómo se hace una novela (How to Make a Novel) (1927) — the autopsy of an Unamuno novel. San Manuel Bueno, mártir (Saint Emmanuel the Good, Martyr) (1930) — a brief novella that synthesizes virtually all of Unamuno's thought. The novella centres on a heroic priest who has lost his faith in immortality, yet says nothing of his doubts to his parishioners, not wanting to disturb their faith, which he recognizes is a necessary support for their lives. Unamuno seen by Ramon Casas (MNAC). Unamuno's philosophy was not systematic but rather a negation of all systems and an affirmation of faith "in itself." He developed intellectually under the influence of rationalism and positivism, but during his youth he wrote articles that clearly show his sympathy for socialism and his great concern for the situation in which he found Spain at the time. An important concept for Unamuno was intrahistoria. He thought that history could best be understood by looking at the small histories of anonymous people, rather than by focusing on major events such as wars and political pacts. Some authors relativize the importance of intrahistoria in his thinking. Those authors say that more than a clear concept is an ambiguous metaphor. The term first appears in the essay En torno al casticismo (1895), but Unamuno leaves it soon. 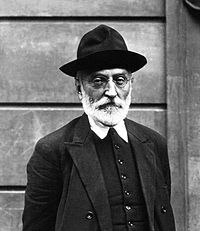 Unamuno: "Those who believe they believe in God, but without passion in the heart, without uncertainty, without doubt, and even at times without despair, believe only in the idea of God, and not in God himself." In the late nineteenth century Unamuno suffered a religious crisis and left the positivist philosophy. Then, in the early twentieth century, he developed his own thinking influenced by existentialism. Life was tragic, according to Unamuno, because of the knowledge that we are to die. He explains much of human activity as an attempt to survive, in some form, after our death. Unamuno summarized his personal creed thus: "My religion is to seek for truth in life and for life in truth, even knowing that I shall not find them while I live." He said, "Among men of flesh and bone there have been typical examples of those who possess this tragic sense of life. I recall now Marcus Aurelius, St. Augustine, Pascal, Rousseau, René, Obermann, Thomson, Leopardi, Vigny, Lenau, Kleist, Amiel, Quental, Kierkegaard—men burdened with wisdom rather than with knowledge." He provides a stimulating discussion of the differences between faith and reason in his most famous work: Del sentimiento trágico de la vida (The Tragic Sense of Life, 1912). A historically influential paperfolder from childhood to his last, difficult days, in several works Unamuno ironically expressed philosophical views of Platonism, scholasticism, positivism, and the "science vs religion" issue in terms of "origami" figures, notably the traditional Spanish pajarita. Since he was also a linguist (professor of Greek), he coined the word “cocotología” ("cocotology") to describe the art of paper folding. After the conclusion of Amor y pedagogía (Love and Pedagogy, 1902), he included in the volume, attributing it to one of the characters, "Notes for a Treatise on Cocotology" ("Apuntes para un tratado de cocotología"). Along with The Tragic Sense of Life, Unamuno's long-form essay La agonía del cristianismo (The Agony of Christianity, 1931) and his novella San Manuel Bueno, mártir (Saint Emmanuel the Good, Martyr, 1930) were all included on the Index Librorum Prohibitorum. After his youthful sympathy for socialism ended, Unamuno gravitated towards liberalism. Unamuno's conception of liberalism, elaborated in essays such as La esencia del liberalismo in 1909, was one that sought to reconcile a great respect for individual freedom with a more interventionist state, bringing him to a position closer to social liberalism. In writing about the Church in 1932 during the second Spanish Republic, Unamuno urged the clergy to end their attacks on liberalism and instead embrace it as a way of rejuvenating the faith. For Unamuno, the art of poetry was a way of expressing spiritual problems. His themes were the same in his poetry as in his other fiction: spiritual anguish, the pain provoked by the silence of God, time and death. Unamuno was always attracted to traditional meters and, though his early poems did not rhyme, he subsequently turned to rhyme in his later works. El Cristo de Velázquez (The Christ of Velázquez) (1920) — a religious work, divided into four parts, where Unamuno analyzes the figure of Christ from different perspectives: as a symbol of sacrifice and redemption, as a reflection on his Biblical names (Christ the myth, Christ the man on the cross, Christ, God, Christ the Eucharist), as poetic meaning, as painted by Diego Velázquez, etc. Unamuno's dramatic production presents a philosophical progression. Questions such as individual spirituality, faith as a "vital lie", and the problem of a double personality were at the center of La esfinge (The Sphinx) (1898), and La verdad (Truth), (1899). In 1934, he wrote El hermano Juan o El mundo es teatro (Brother Juan or The World is a Theatre). Unamuno's theatre is schematic; he did away with artifice and focused only on the conflicts and passions that affect the characters. This austerity was influenced by classical Greek theatre. What mattered to him was the presentation of the drama going on inside of the characters, because he understood the novel as a way of gaining knowledge about life. By symbolizing passion and creating a theatre austere both in word and presentation, Unamuno's theatre opened the way for the renaissance of Spanish theatre undertaken by Ramón del Valle-Inclán, Azorín, and Federico García Lorca. From somewhere in the auditorium, someone cried out the motto "¡Viva la Muerte!" [Long live death!]. As was his habit, Millán Astray responded with "¡España!" [Spain! ]; the crowd replied with "¡Una!" [One!]. He repeated "¡España! "; the crowd then replied "¡Grande!" [Great!]. A third time, Millán Astray shouted "¡España! "; the crowd responded "Libre!" [Free!] This – Spain, one, great and free – was a common Falangist cheer and would become a francoist motto thereafter. Later, a group of uniformed Falangists entered, saluting the portrait of Franco that hung on the wall. whether you like it or not, is Catalan, born in Barcelona. But now I have heard this insensible and necrophilous oath, "¡Viva la Muerte! ", and I, having spent my life writing paradoxes that have provoked the ire of those who do not understand what I have written, and being an expert in this matter, find this ridiculous paradox repellent. General Millán Astray is a cripple. There is no need for us to say this with whispered tones. He is war cripple. So was Cervantes. But unfortunately, Spain today has too many cripples. And, if God does not help us, soon it will have very many more. It torments me to think that General Millán Astray could dictate the norms of the psychology of the masses. A cripple, who lacks the spiritual greatness of Cervantes, hopes to find relief by adding to the number of cripples around him. Millán Astray responded: "Death to intelligence! Long live death!" provoking applause from the Falangists. Pemán, in an effort to calm the crowd, exclaimed "No! Long live intelligence! Death to the bad intellectuals!" Unamuno continued: "This is the temple of intelligence, and I am its high priest. You are profaning its sacred domain. You will win [venceréis], because you have enough brute force. But you will not convince [pero no convenceréis]. In order to convince it is necessary to persuade, and to persuade you will need something that you lack: reason and right in the struggle. I see it is useless to ask you to think of Spain. I have spoken." Millán Astray, controlling himself, shouted "Take the lady's arm!" Unamuno took Carmen Polo by the arm and left under her protection. In 2018, the details of Unamuno's speech were disputed by the historian Severiano Delgado, who suggested that the account in a 1941 article by Luis Gabriel Portillo (who was not present at Salamanca) in the British magazine Horizon may not have been an accurate representation of events. However, Delgado agrees that a "very fierce and violent verbal confrontation" between Unamuno and Millán Astray definitely occurred, which led to Unamuno being removed from his rectorship. ^ Mary Ann Alessandri, Mary Ann Alessandri "Flesh and Bone: Unamuno's "Quixotism" as an Incarnation of Kierkegaard's "Religiousness A", Dissertation, The Pennsylvania State University (2010), p. iii. ^ "The Project Gutenberg eBook of TRAGIC SENSE OF LIFE, by MIGUEL DE UNAMUNO". gutenberg.org. Retrieved 27 August 2015. ^ "Abel Sánchez by Miguel de Unamuno". Project Gutenberg. Retrieved 27 August 2015. ^ Unamuno, Miguel de (1 September 1924). "Conferencia en "La Sociedad El Sitio"". El Socialista. ^ Evans, Jan E. (2014). Miguel de Unamuno's Quest for Faith: A Kierkegaardian Understanding of Unamuno's Struggle to Believe. James Clarke & Co. p. 116. ^ Schmitt, Hans A. (1988). Neutral Europe Between War and Revolution, 1917-23. University of Virginia. pp. 29–30. ^ Cobb, Christopher (1976). Artículos Olvidados Sobre España y la Primera Guerra Mundial. Tamesis. pp. ix-1. ^ "Casa museo Miguel de Unamuno en Fuerteventura". Absolut Lanzarote. Retrieved 17 September 2014. ^ Evans, Jan E. (2013). Miguel de Unamuno's Quest for Faith: A Kierkegaardian Understanding of Unamuno's Struggle to Believe. Wipf and Stock Publishers. p. 121. ^ Pierre Broué and Emile Témime (2008). The Revolution and Civil War in Spain. Haymarket Books. p. 440. ISBN 978-1931859-51-6. ^ Toledano, Ana Chaguaceda (2003). Miguel de Unamuno, estudios sobre su obra, Volume 4. Universidad de Salamanca. p. 131. No, no me he convertido en un derechista. No haga usted caso de lo que dice la gente. No he traicionado la causa de la libertad. Pero es que, por ahora, es totalmente esencial que el orden sea restaurado. Pero cualquier día me levantaré —pronto— y me lanzaré a la lucha por la libertad, yo solo. No, no soy fascista ni bolchevique. ¡Estoy solo!...¡Solo, como Croce in Italia! ^ Litvak de Kravzov, Lily (January 1967). "Nikos Kazantzakis y España". Hispanófila. 29: 37-44. ^ Antony, Beevor (2006). The Battle for Spain. London: Phoenix. pp. 111–113. ^ Sean Farrell Moran, "The Disease of Human Consciousness," in Oakland Journal, 12, 2007, 103–110. ^ Azurmendi, Joxe: Espainiaren arimaz, 2006. p. 90. ^ Quoted in Madeleine L'Engle, Walking on Water: Reflections on Faith & Art (New York: Bantam Books, 1982), 32. ^ Azurmendi, Joxe: "Unamunoren atarian" in: Alaitz Aizpuru, Euskal Herriko pentsamenduaren gida, 2012. p. 40. ^ For a bird-figure folded by him in November 1936, see Vicente Palacios, Papirogami: Tradicional Arte del Papel Plegado (Barcelona: Miguel Salvatella, 1972), p. 122. ^ John A. Mackay, The Meaning of Life: Christian Truth and Social Change in Latin America (Eugene, OR: Wipf & Stock, 2014), p. 158. ^ Harrison, Joseph; Hoyle, Alan (2000). Spain's 1898 Crisis: Regenerationism, Modernism, Postcolonialism. Manchester University Press. p. 73. ^ Unamuno, Miguel. "Rosario de sonetos liricos". archive.org. Madrid: Imprenta Espanola. Retrieved 15 February 2017. ^ Jones, Sam (11 May 2018). "Spanish civil war speech invented by father of Michael Portillo, says historian". The Guardian. ^ "OPINIÓN: 'Pichichi', de Hugo a Chicharito" [OPINION: 'Pichichi', from Hugo to Chicharito] (in Spanish). Goal.com. 2 September 2014. Retrieved 3 August 2017. Álvarez, José Luis. 1966: "Unamuno ala Jammes? ", Jakin, 21: 81–84. Sáenz, Paz, ed. (1988). Narratives from the Silver Age. Translated by Hughes, Victoria; Richmond, Carolyn. Madrid: Iberia. ISBN 84-87093-04-3. This page was last edited on 29 March 2019, at 19:33 (UTC).